The Society of Certified Senior Advisors (SCSA) educates and certifies professionals who work with seniors. 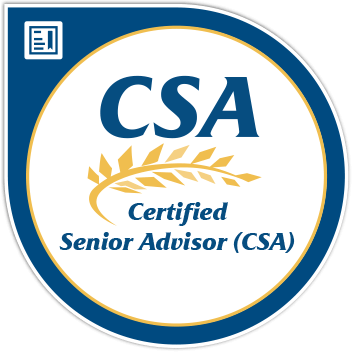 The Certified Senior Advisor (CSA)® credential applies to professionals who are able to demonstrate their competence and knowledge of working with older adults into their professional practices. By creating a network of qualified professionals, SCSA strives to create a strong and safe environment for seniors and those working with them. The CSA certification and education programs are developed through a rigorous practice analysis/research study involving hundreds of professionals who work with the older adults from the academic community, industry practitioners, regulators, business and non-governmental organizations. Accredited by the American National Standards Institute (ANSI) and the National Commission for Certifying Agencies (NCCA), the CSA credential applies to professionals in all areas of the aging industry. SCSA is committed to maintaining the high standards of ANSI and NCCA accreditation by continually improving its certification and education programs. Check out the latest episode of Elder Law TV where Attorney Patrick Kelleher interviews Sean McDonnell, President of Cottage Caregivers. Cottage Caregivers is excited to announce our partnership with Homecare Express of Hanover, MA. Cottage Caregivers provides high level compassionate, professional and dependable senior home care across with South Shore and Southeastern, MA. Homecare Express based in Hanover, MA has provided high quality durable medical equipment on the South Shore since 1999. They provide a wide range of home medical equipment and oxygen supplies coupled with a professional and experience staff to meets all of the healthcare needs for their clients. As a result of the partnership clients of Cottage Caregivers clients & families will receive special pricing and delivery programs from Homecare Express. Cottage Caregivers will also provide special pricing for any Homecare Express customer. 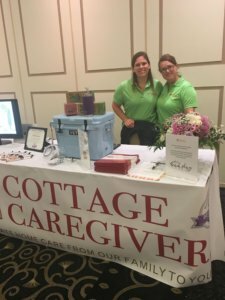 Cottage Caregivers, LLC is a locally owned business committed to providing professional, non-medical home care to the people of Plymouth, Norfolk and Bristol Counties in Massachusetts. We provide customized, affordable, basic home care services, which allow individuals to maintain their independence and stay in the comfort of their own home environment. Cottage Caregivers is a proud winner of the Best of In-Home Care Award from SeniorAdvisor.com, the largest ratings and reviews site for senior care and services in North America. This recognition represents the top tier of in-home care, assisted living, and other senior living providers, based on the online reviews written by seniors and their families. This exclusive designation places the winners in the top one percent of senior care providers according to those who matter most – the consumer. Cottage Caregivers is one of the only home care winners in Massachusetts and has consistently ranked at the highest levels in family reviews across multiple online channels including Facebook, Caring.com. Care.com and the Better Business Bureau. Homecare Express is a family owned business that has been proudly serving the South Shore’s durable medical equipment needs since 1999. Our valued customers know they can rely on our wide range of home medical equipment and oxygen supplies and helpful staff for all of their healthcare requirements. With Homecare Express’s retail showroom and distribution center, we offer a quality, caring service and a customized experience for every client. As a complete provider of health-related equipment and supplies; Homecare Express carries everything from durable medical equipment to aids to daily living and a full line of motorized wheelchairs and lift chairs. Homecare Express is your one-stop solution for durable medical equipment and supplies with the experience and the staff to assist you. Visit us at 10 East Street Hanover MA or online at HomeCareXpress.com. Karen Carroll, Managing Director and Julie Morse, Senior Client Care Manager working the Cottage Caregivers booth at last week’s Senior Service Networking Conference. A great event! How do I convince my aging parent to accept in-home care? Ally with the more independent parent. When your parents are both living and reside in their own home together, direct your attention to the less needy one. For instance, suggest that their spouse would be the one to benefit from outside assistance even when they both might. By allying yourself with the more independent parent, you may ultimately be able to get them both to accept the help they require. This is important as well as studies have shown that the primary caregiver in the home will often experience additional health issues to do the fact they are truly caring for two people. Another approach might be to suggest hiring a caregiver to manage some household chores and NOT actual hands-on care or personal assistance. Often this is seen as less threatening to a loved one’s independence and will serve as a means to “get the caregiver’s foot in the door”. Suggest help with food shopping and traveling to appointments, particularly when driving is no longer an option. If you also let them know it is a trail period they are often more accepting and once they see the value they will almost always continue with the services. If your parent is living alone or with you, redirect the attention on YOU as the caregiver needing the home care assistance for peace of mind. Emphasize that you would be the one to benefit a lot from such help as many parents place concern for their children’ welfare before their own. If a Caregiver can come in to assist your loved one with bathing and personal care, you would have more time to manage other household responsibilities. As a working caregiver, suggest that by having a companion or assistant stay with your loved one, it would relieve you of worries and concerns while away. Another idea might be to seek the help and advice of a trusted professional who is someone your parents hold in high regard. They might surprise you by their willingness to accept the advice of a long-time family physician, a former or current home health nurse, or a family friend in the medical field. Many home care agencies will have a Nurse on staff for assessments which can help with the discussion as well. Don’t take their resistance personally. In many families, your conflicting role as the child and caregiver hinder your well-meaning attempts at helping your parents. The basis for your actions should not be confused by misguided guilt. Therefore, do not take their rebuttals personally or offensively, but rather focus on a necessary means to an end. 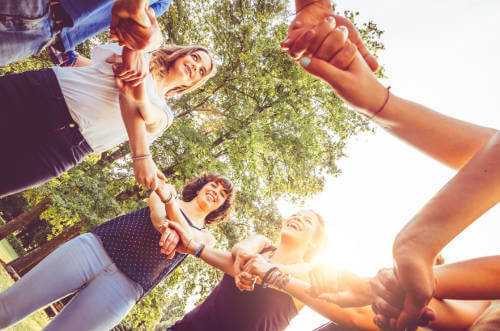 As mentioned earlier, it is important to have them get the support they need prior to an event such as a fall or other health related issue due to not getting the support they need as soon as they need it. Studies show that animals can be wonderful companions for older adults—their presence can calm agitation, alleviate loneliness and even lower blood pressure. A family pet can truly be a best friend to an aging adult who lives alone, and pet therapy is a popular approach in long-term care facilities for enriching residents’ lives. While animals can make wonderful companions, they also require care and must be a good match for their human partner’s personality, functional abilities and financial situation. Use these pointers to ensure a senior is up for pet ownership before matching them with the perfect new furry friend. A dog’s breed can tell you some things about him, but it can’t tell you everything. While people tend to only take looks into account when adopting, the best way to choose a pet is to carefully consider what you’re looking for in terms of personality, size, age, maintenance needs, and energy levels. Typically, the only instances where breed is of utmost importance is if the potential owner needs a “hypoallergenic” dog or one that does not require intensive grooming. Although dog breeds are often associated with certain temperaments, every dog has a unique personality. Will the senior want an outgoing companion who will keep them company on their daily walks, or more of a lapdog type who is content watching movies on the couch? Think about the potential owner’s average daily routine and consider how an animal would ideally fit into it. It is important to interact with an animal before taking them home in order to get a good feel for their personality. Some dogs are anxious or aggressive, and some do not get along with strangers, children or other animals. This doesn’t mean that a particular dog is “bad” or will always be difficult, but it could indicate that they’ll need special attention or extensive training to help them socialize and feel more secure. A good rule of thumb is to look for a dog who is friendly and capable of calming down within a few seconds while in a comfortable setting. While most people favor puppies for their cuteness and playful antics, adult dogs are equally as adoptable, if not more so. For this reason, adult dogs make for a more confident match. Another benefit of adopting older dogs is that they are typically house trained already and do not require as much rigorous exercise. Starting from scratch with a puppy requires a great deal of energy, time, attention and patience, which a senior may not want to deal with. Many seniors are living on limited incomes, and a pet of any kind is a serious investment. There are initial expenses for adoption/purchase, spaying/neutering, supplies, and vaccinations as well as ongoing expenses for food, toys, grooming, medical exams, preventive treatments, and flea and tick control. Veterinary care is undoubtedly the most expensive aspect of pet ownership, so be sure to ask about an animal’s health issues prior to adoption. Some breeds are prone to specific medical conditions, and just as in humans, dogs tend to develop more problems as they age. Emergency vet visits are another reality of having a pet that can get expensive very quickly. 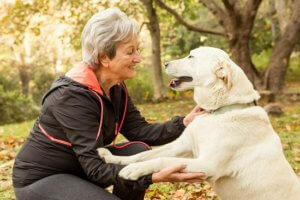 If a senior does not have the financial means or stamina for pet ownership, there are other options available. Shelters and rescue groups are always in need of volunteers to help care for dogs, cats, birds, rabbits and other animals. Some even run foster programs that allow volunteers to bring animals home temporarily and provide one-on-one attention that will help increase their chances of adoption. 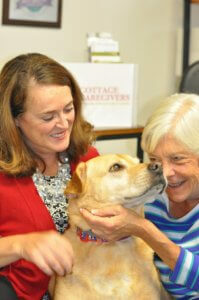 Visiting pet therapy programs are another source of valuable interaction. 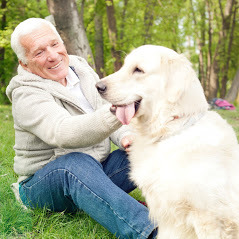 Senior centers, adult day care centers and long-term care facilities often host activities with therapy animals, and some animal therapy organizations even offer home visits. For seniors who are living with dementia, a cuddly stuffed animal may provide sensory stimulation and companionship without the walking, training and vet bills. There are even robotic products on the market that make realistic animal movements and sounds. 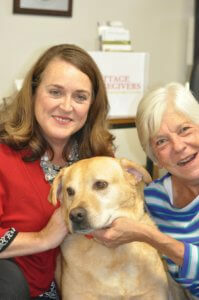 There is no doubt that a pet can provide unconditional love and play a part in improving a senior’s quality of life. Just be sure to carefully consider the commitment and see to the wellbeing of both the senior and the animal.